Q. 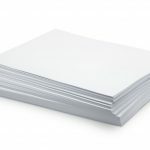 How long does it take to save 5 miles of paper? A. Not long. Progressive Marketing Group’s paper-saving initiative has reached 28,000 pages saved. That’s 56 reams. Nearly five miles of paper. Yessssss! We’ve also managed to save 1,200+ bottles, both plastic and glass, from the trash and recycle them. While the $60 is nice, the Environment is smiling more than we are. Conservation works. And PMG is very proud to do our small part for a very large world.